The Creative Muvo Mini contains every desirable feature you seek out in a Bluetooth speaker: full sound, attractive design, long battery life – and the cherry on top, weatherproofing. For under 100 bucks, that's an unbeatable deal. Bluetooth speakers are more capable and feature-packed than ever. We've seen mighty sound packed into some small form factors, options with incredible battery life and even some that can take a tough tumble. But we haven't seen a single speaker that can accomplish all of these feats – until the Creative Muvo Mini came along. This jack-of-all-trades Bluetooth speaker comes highly recommended for listeners with a sub-$100 budget who don't want to sacrifice sound quality in favor of saving a buck. At just $60 (£49, AU$69), you'll be hard pressed to find a better value in the Bluetooth speaker market right now. 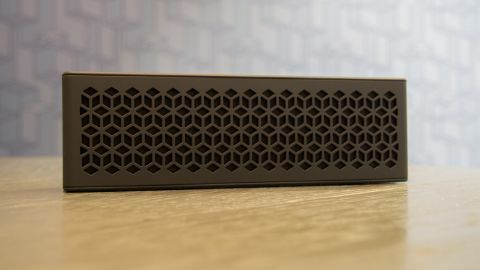 Like the Jawbone Mini Jambox, the design of the Creative Muvo Mini will totally split the crowd. I, for one, am a sucker for the minimalistic touches found in each, but I recognize that some might think that the style comes off uninspired. Considering that this speaker goes for the cost of a video game, most will be impressed with its looks and overall build quality. The entirety of the rectangular Muvo Mini is covered in a smooth, matte plastic. The review unit that Creative sent to TechRadar is colored in a stunning grey, but red, blue and white options are also available. The speaker's front is capped with a grille, which itself sports its own neat design touches. Its perforation pattern on the grille looks to be a bunch of three-dimensional boxes, but you might see it another way. Directly beneath the grille, a slick mesh layer covers the dual drivers and the bass radiator. Moving up to the speaker's top, the Muvo Mini sports a set of buttons and a site for tethering your device via NFC if it's capable. From left to right, there's a power button, a Bluetooth button and two volume buttons, increase and decrease. Each of the buttons' functions are self-explanatory, except for the Bluetooth button, which operates with multiple functions. Not only can you hold it for a few seconds to put the speaker into pairing mode, but you can also answer and hang up a phone call with a single press. Surrounding the panel of buttons are a few LEDs to present a helpful visual indicator of the speaker's connection and battery status. Around its backside, Creative stamped on its very subtle branding. Just below, a rubber flap covers the micro USB and 3.5mm ports. Make sure this flap is closed if you plan on exposing the Muvo Mini to dust or water. Inside the box, you'll find a micro USB cable that's used to charge the Creative Muvo Mini. You're not going to find much more than that, unless product manuals interest you. It's a remarkably simple-looking speaker packed into an equally inconspicuous package, but you'll be surprised by its sound and endurance. It's easy to make an excuse for small Bluetooth speakers that don't sound good. "Well, it's just so darn small. What do you expect?" We expect better, and the Creative Muvo Mini puts out an impressive sound that defies the bounds of its small form factor. Frankly, this speaker is leaps ahead of the competition at the $60 price point. The sound that comes from this rectangular box excels at avoiding distortion even at high volume levels. Its front-facing bass radiator does an admirable job of pumping out the low-end notes, but if I had to point out the speaker's weakest skill, this is it. Even so, the gamut of music genres sound surprisingly full through this speaker, chock full of warm mids and highs to appreciate. Inside the speaker is a battery that lasts long enough to provide the soundtrack to practically any party. The Muvo Mini is advertised to go without a charge for 10 hours, and it met that hearty quota easily. Creative's Muvo Mini has already provided more than enough reason to jump at its low price tag, but it has one more trick up its sleeve: weatherproofing. This speaker has an IP66 rating, meaning that it's completely dustproof and waterproof just shy of the point of being submerged. Spray it all you want, just don't dunk it underwater. I tested out the Bluetooth range of the Muvo Mini by leaving my phone in one place and walking around my studio apartment, which is about 30 feet in length. There wasn't a single audio artifact or drop in connection, even through a few walls. When using it as a speakerphone, call quality was just fine and the person on the other end had no issue hearing my voice through the microphone. Just $60 for a Bluetooth speaker is an attractive price, but is it possible to avoid disappointment and sacrifice? Yep. With Creative's Muvo Mini, 60 bucks gets you enough functionality and performance to warrant a considerably higher price. Not only is it cheap, but this tiny box sits on the throne as the best value around for a durable and capable Bluetooth speaker.